Pyramis Romania was founded in 2004, as a branch of the Pyramis Metallourgia multinational and invested over 2 million Euro in their latest location. The overall surface is of 4700 metres of which 600 square metres of showroom and offices, 1500 metres of storage area. In their 12 years of activity in the local market, Pyramis Romania has always offered the complete solution for kitchen equipment. 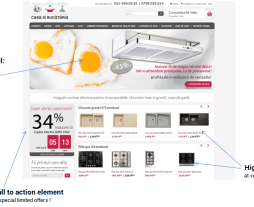 The Client is one of the most important Romanian companies for distribution of home and kitchen products. Their main distribution channel was through main retailers (e.g. IKEA). They want to increase their turnover from B2C channel and also to have a good channel for selling the products that are in the liquidation of stock. We assigned a team of dedicated professionals: project manager (understood the business and the site goals; was the person in charge with client’s communication; coordinated the development team for the entire process); designer (a person with extensive experience in marketing and, commercial design and UI Design); developer (knows the most effective solutions and programming technologies to create the desired functionalities); QA: tested the site during the development process and before launching the project. Identification and analysis of decision makers (whom they want to convince ?). Identification of the differentiators of the company (why customers should buy from here and not from somewhere else?). Identification of the "trust elements" (certifications, experience, testimonials etc.). Identifying the possible communication routes, head-lines, pictures, call to action elements, command buttons , contextual elements of action. Realization of graphical templates and revisions on the layout based on the client feedback. Our client desired fast, quality web experience on any browser, device, technology or network they could used. Based on the analysis documents agreed, using cutting-edge technology we perform: database design, back-end functionalities and front-end functionalities. Our developers know the importance of: using the latest PHP an MySql versions, clean code development, modular code development, OOP programming, agile methodology. 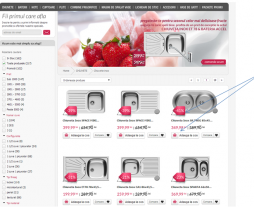 We successfully delivered the proper customised solution for an advanced e-commerce store. Menu: the structure was build for intuitive navigation through multiple categories and subcategories of a product database of over 1.000 items. 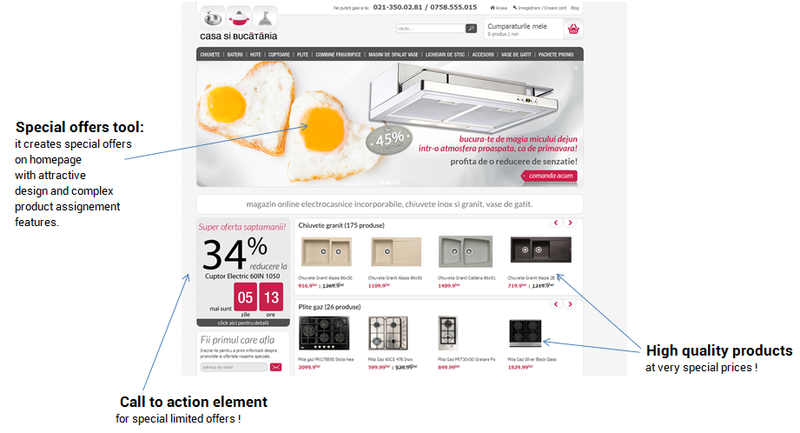 Special offers (with features specially designed for homepage): the proper solution to present the product information, in an attractive background, by using suggestive images, call to action elements, special prices and discount calculation, all together defined in a very easy to use special offers module in the CMS. Exclusive website offers with limited time for a very significant discount, build on a counter of remaining days and hours for getting the discount. A tool for client fidelization which assures significant conversions and high number of returning visitors. Categories present a very high number of a quite significant variety of products. We development a custom layered navigation system in order for each type of customer to easily identify the perfect product (from prices to advanced technical details). We used call-to-action elements for the products displayed in the category. We put great accent on discount calculation and add to cart. 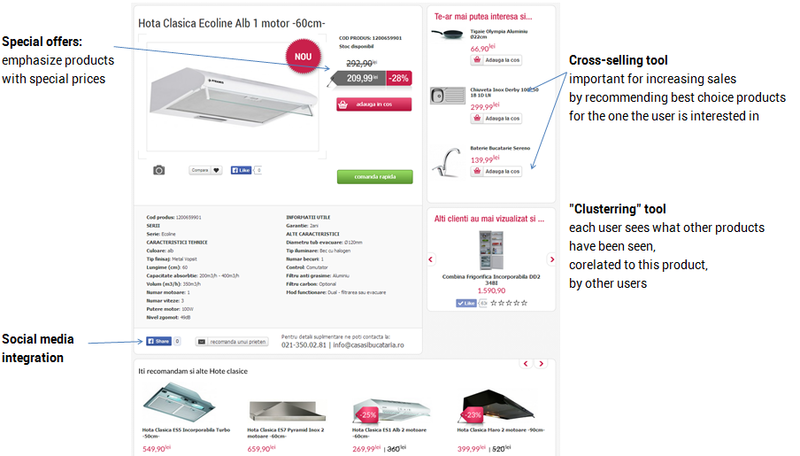 Cross selling tool: kitchen products are mostly bought more than one at a time if they are presented together, in an attractive and intuitive manner. 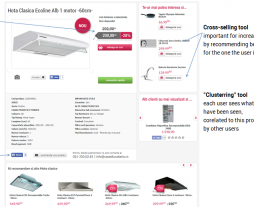 So we build a cross-selling tool in order for the client to easily create connection between products. It proved to be a great solution for increasing sales, the previous online store the client had the orders were most of only one product. Clustering tool: we know that for each client is very important to have the confirmation that the product he is interested is of very attractive. Each user sees what other products have been seen correlated with the accessed product, so he / she can easily go to a better choice, based on a common interest with the other visitors of the same niche. Social media integration: it proved to be a very efficient tool to self promote products. This online store has the advantage of having very good looking products of a great quality. A very important part of the site traffic is generated from social media, from the likes and shares of the site visitors.